This is the last flower featuring in my Advent Sunday series, and I think it looks rather festive too! I grew two of these from seed, and was amazed at how well they grew! They loved it in my dry and very hot rockery, and looked good until the first frost. The large glossyy leaves are an exotic addition to the garden – not really fitting in with other plants at all. In fact they are almost gaudy, but the small flowers and seedheads are somehow very attractive and every time I passed this plant I would admire it. The common name in German is Wunderbaum (Miracle Tree) and this seemed very appropriate as I could not believe its growth and stature! It was not until I looked up the English common name – Castor Oil Plant – that I realized this is where castor oil comes from. I had never given it a thought before. Only one drawback if you have pets or small children – this plant and its seeds are toxic. Ours was tucked well into the barely accessible rockery. Here’s another (more seasonal) plant that is exotic for us in Europe. Do you have these at Christmas time too? Enjoy the last few days before Christmas! This entry was posted in Days, Garden, Nature, Plants and tagged Christmas, Garden, Nature, Plants, Winter. Bookmark the permalink. Ricinus communes looks rather Christmasy in reds and greens. I don’t have any poinsettias yet this year but there’s still time. 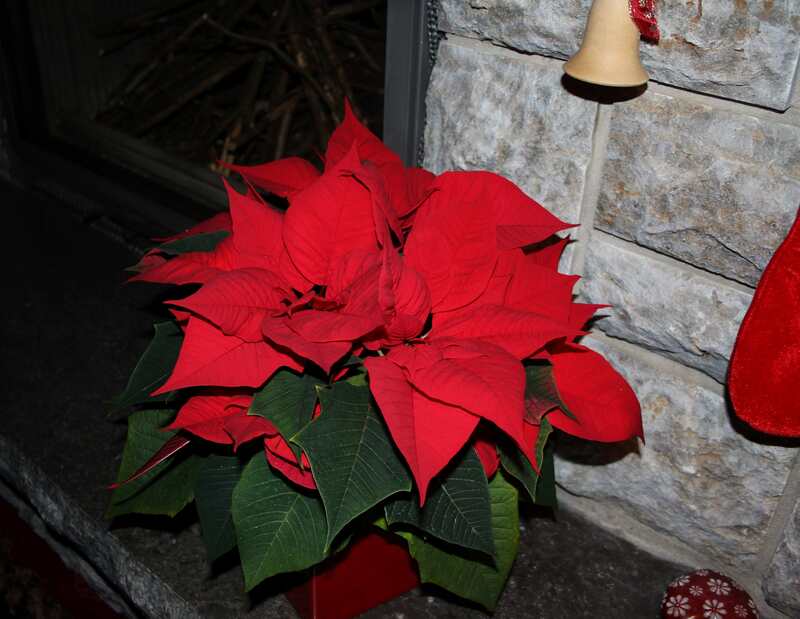 It’s difficult to keep the poinsettias for long here as they drop their leaves – cultivated in greenhouses just for the season! Mine has done well so far! Hi Christina. I liked the leaves more than the flower/seed head, although that’s rather attractive too. I always succumb to their cheerful festive bracts! Yes, I liked the Ricinus foliage a lot too. I have pressed a couple of the leaves, so hope they turn out well. Seeds of “Wunderbaum” were given to us in school. I think the plant is stil in my mother´s garden. Thanks Uta! So the Wunderbaum seed themselves? I was so worried about the seeds being toxic that I removed them all! Yes, I suppose you are right… more than we think! My dogs don’t eat anything in the garden except the wild strawberries and maybe a rose hip or two, but I still removed the bright seeds – better safe than sorry! Really pretty and definitely festive! I don’t grow Ricinus because of their toxicity, but they do grow quite well in our climate; they love the aridness of our summers. I don’t have a poinsettia this year, although I usually pick one up. I never save them over to try to get them to rebloom, though – too much work! Have a very Merry Christmas! Wishing you all the best! Latin ricinus is the source of our word ricin, the name of the deadly poison (which people who hear the word spoken may mistakenly think has something to do with rice). The castor bean plant isn’t native in Texas but it can occasionally be found growing in the wild here. Thanks Steve! It would be odd to see such a plant in the wild here! I came across this plant used in a border (and en masse) a while ago and thought WOW!! and seeing your photos I’m reminded of that wow factor. Thanks – same to you Claire! 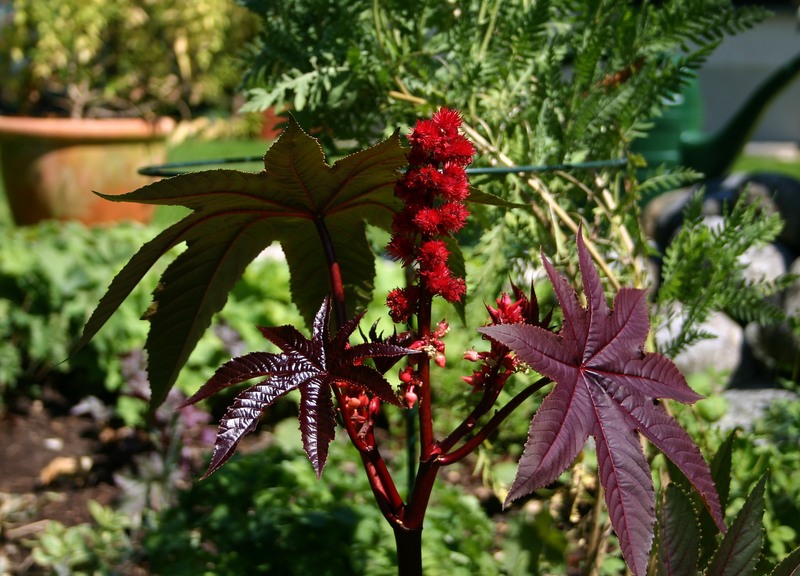 I’ve seen Ricinus planted with Canna and palms in a park and they looked great… that’s what made me want to try growing them in fact. I gave up on cannas a few years ago but these were a success. The German name is so much nicer than the English! Either way, it’s an impressive looking plant. Have a great Christmas Cathy! You too Sarah! The German plant names are often very apt! Nice exotics Cathy…I do not have luck growing exotics. This was my first attempt… beginner’s luck? 😉 I shall definitely try more in the future though. Happy holidays, Cathy! I’ve enjoyed your Advent Sunday series. Caster bean, canna lilies, hardy bananas, and many other tropical are common in South Carolina, but not in my shady garden. I don’t really miss them, though. Not as much as peonies, roses, and salvias! Happy Holidays to you as well Marian! Glad you enjoyed the series. I love banana plants and will try and grow something exotic every year now. I tried to grow a peanut plant this year. It came in a tin and was supposed to be very easy, but it died … hmmm. I guess not so easy?! I’m not exactly Miss Greenfingers though. Great color on the castor bean! I’ve tried growing the red ones a few times but just haven’t found the real bright ones yet. They drop their leaves pretty quickly, but for a couple of weeks around Christmas I love the festive look of them. Enjoy the holidays! Splendido spazio di Anima e Cuore! That’s a beauty and that much more amazing to have grown it from seed. Did it flower the first season? Yes, sown in May and flowering by early August! It grew so quickly you could almost watch it! Unfortunately the first frost got it – not a hardy plant at all.